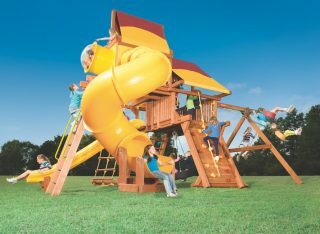 LARGE LUMBER – Outback XL 5′ playset includes a 36 sq. ft. fort, vinyl roof, three-chain tire swing, dual ladder, rock wall, rope rung ladder, monkey climber, 10′ Super slide, four-position swing beam, and accessories. Available in EITHER Cedar or Premium Heart Redwood. FREE Shipping and professional installation is available. 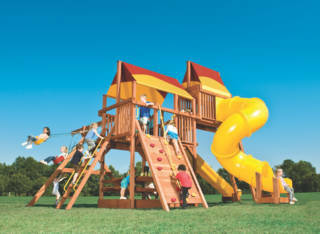 The Woodplay Playsets Outback is available in EITHER Cedar or Premium Heart Redwood lumber. All Outback Series playsets are made with larger lumber throughout the ENTIRE playset compared to similar looking playsets. The Outback deck is supported with 4″x6″ beams and notched angle braces. Our Outback Series playsets are strong enough for even dads to join in on the fun! At Woodplay, we invite you to shop and compare wooden swing sets. How do other brands stack up against The Original Redwood Playset? Examine the structure, grade of materials, safety features, styling, sustainability, and custom designs. Available for prompt delivery, so ships in two to four days. We do offer professional installation on the Outback 5′ (OB.5XLA), so please call us for more information. Non-toxic, water-based stain and sealant, which protects the playset for years to come. 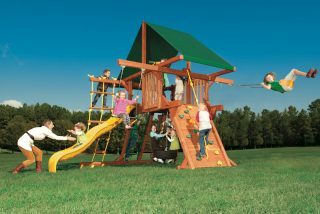 The Woodplay Playsets Outback (OB.5XLA) includes EITHER a Limited Lifetime (Redwood, lumber only), 15-Year (lumber only), and a 5-Year warranty. 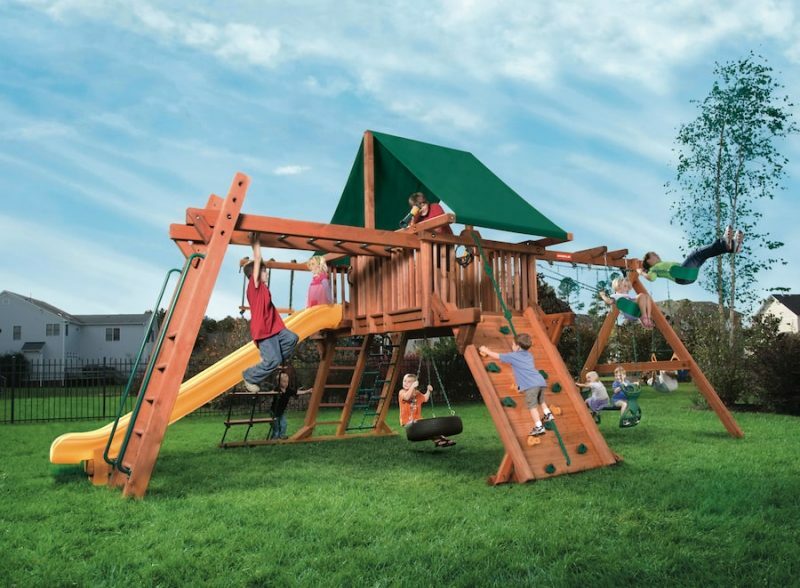 For the lifetime of our redwood playsets, Woodplay warrants, to the original retail purchaser all wooden components against structural failure due to corrosion, wood rot, or insect infestation. Seasonal checks, surface cracks, knotholes and knots not resulting in structural failure, are natural characteristics of all wooden play equipment, and are not covered under this warranty and will not affect the integrity of your playset. Woodplay warrants to the original retail customer that we will replace any swing hangers, swing chains, metal braces, metal rungs or hardware that fail due to rust or breakage (excludes surface rust). This limited lifetime warranty also applies to our exclusive Super Slide, Hurricane Slide, and Alpine Slide. 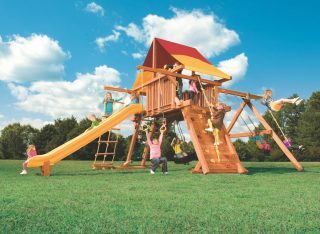 For fifteen years after the original purchase date of our cedar playsets, Woodplay warrants, to the original retail purchaser, all wooden components against structural failure due to corrosion, wood rot, or insect infestation. Seasonal checks, surface cracks, knotholes, and knots, not resulting in structural failure are natural characteristics of all wooden play equipment, and are not covered under this warranty and will not affect the integrity of your playset (Lumber Only). 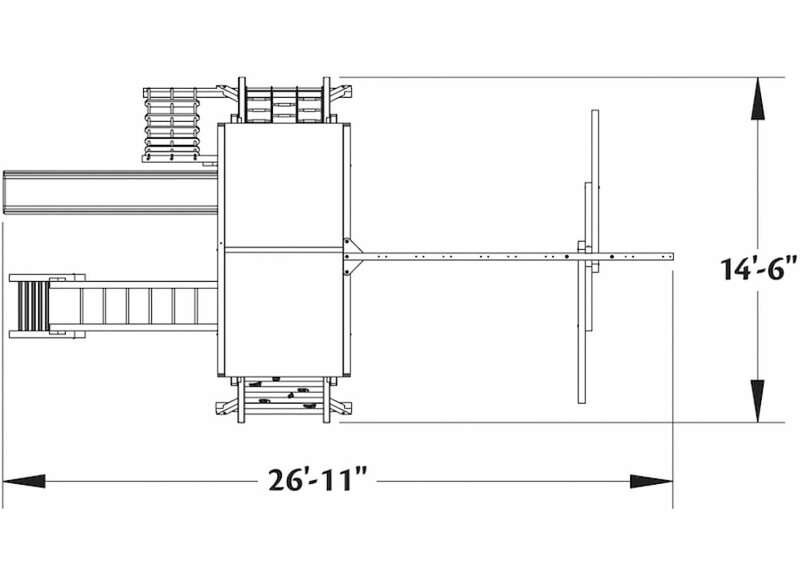 Subject to proper installation and normal residential use, Woodplay warrants, subject to the limitations stated below, to the original retail purchaser all chain, seats, swing hangers, hardware, metal braces, ropes and accessories to be free from defects in material and workmanship for a period of five years from the date of purchase. Cracks in non-functional plastic components are not considered defects in materials and workmanship if they do not affect the functionality of the playset. Merchandise covered under this limited five-year warranty will, at our option, be repaired or replaced, excluding any freight or labor fees. Are you looking for a deeply mark downed playset? View our FLOOR MODEL DISPLAY page.